Perfect sofa? Check. Renovated kitchen? Check. But if you want to really raise the sophistication level in your home decor, original art is in order. If you find the process of picking a modern masterpiece intimidating (not to mention expensive), fear not. This installment of our Lazy Homeowner’s Guide offers easy, budget-friendly strategies to score stunning pieces for your pad. So go ahead. Read, shop, repeat—and then stand back and enjoy! Want gallery-grade work at nongallery prices? 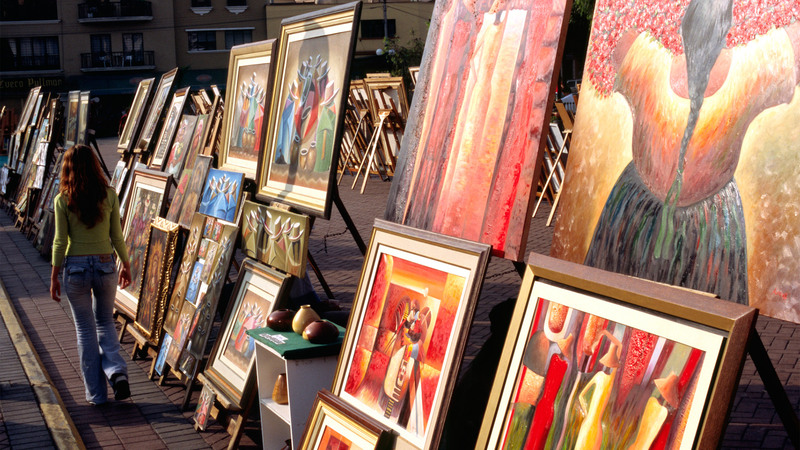 Skip the galleries and head to an art fair instead. “There are great prices at art fairs because the overheads are so low in comparison to a gallery,” says Lola Bodansky of Lola Bodansky Design Consultants. Some big art fairs to hit include California’s annual Palm Springs Fine Art Fair and The Art Show in New York City, organized each year by theArt Dealers Association of America. The handy Art Fair Calendarhighlights events throughout the year, including the 47th Annual Ann Arbor Summer Art Fair in Michigan in July and Minneapolis’ renowned Uptown Art Fair in August. Colleges can pose an excellent opportunity to snag stunning pieces from up-and-coming artists. “Working with an art consultant can steer you in the right direction,” Bodansky says. Sure, they require a fee, but galleries often give art consultants 20% off, which can balance the cost of hiring them. For general advice—including artists to watch, trends to follow, and how to value pieces—art consultants charge clients $100 to $250 an hour. Find an art consultant in your area through the Association of Professional Art Advisors. To learn more about art collecting, Bodansky suggests following bloggers “who have an inside opinion of the talented artists out there” or visiting sites such as Artsy.net. In addition to selling more than 200,000 works on the site (ranging in price from $100 to $1 million), Artsy offers news about gallery and museum exhibitions and art fairs around the world. The site also provides art-savvy specialists (hailing from auction houses, galleries, and museums) who can help guide buyers to pieces matching their taste in their price range. The expression “one man’s trash is another man’s treasure” can also apply to art. You’d be amazed by what people are willing to unload for a song when they’re raring to clean out their attic or moving across the country. To find these castoffs, head to flea markets, antiques fairs, and estate sales, says Bodanksy. Find events in your area on Americanfleas.com and Fleamarketfinder.org, both of which detail events by city and state. Locating estate sales is a cinch with photo-filled directories such as EstateSales.org and EstateSale.com.